Signal Lamp, AL-244, 220VAC, green, with cap Signal lamp AL-244 with rated voltage 220 VAC, green, with cable and cap. List Price 1.00лв. VAT Incl. 0.95лв. VAT Incl. 0.90лв. VAT Incl. 0.85лв. VAT Incl. 0.80лв. VAT Incl. Signal Lamp, AL-240, 220VAC, green Signal lamp AL-240 with a rated voltage of 220 VAC, green, with cable. 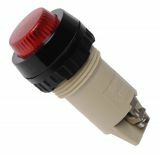 Signal Lamp, AL-244, 220VAC, red , with cap Signal lamp AL-244 with a rated voltage of 220 VAC, red, with cable and cap. Indicator lamp, green 9 V, glim, green Indicator lamp with rated voltage 9 V.
Plate for indicator lamp blue Ф6mm Blue indicator lamp tray. Glim indicator lamp, DH16-1, 12VDC, green Glim indicator lamp, DH16-1. Glim indicator lamp, DH16-1, 12VDC, red Glim indicator lamp, DH16-1. Indicator Glim Lamp, 24VDC, RED Square glitter lamp, rated at 24VDC. LED indicator lamp XH020, 220VAC Red Indicator Lamp XH020,with rated voltage 220 VAC and mounting nut M12. Glim indicator lamp, 220VAC red Red indicator lamp, with rated voltage 220VAC. Glim indicator lamp, 220VAC geen Green indicator lamp, with rated voltage 220VAC. INDICATOR GLIM LAMP, 250V, RED Square glitter lamp, rated at 250V. Small and compact with wires. 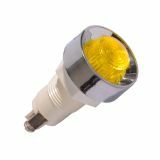 Indicatior Glim Lamp XH020, 220VАC, yellow Indicator glim (neon) lamp XH020 with rated voltage 220 VAC and mounting nut M12 and yellow color. Glim Indicator Lamp, 250-380VAC, red Red indicator lamp,with rated voltage 250 - 380 VAC. Glim Indicator Lamp, 220VAC, green Green Indicator Lamp, with rated voltage 220 VAC. List Price 0.90лв. VAT Incl. 0.85лв. VAT Incl. 0.81лв. VAT Incl. 0.76лв. VAT Incl. 0.72лв. VAT Incl. Panel mount indicator lamps or visual signaling light fixtures are very widely used in households , industry and technology. They are designed to serve as a light alerting for workflows, accidents, any change in operating status of equipment and others. 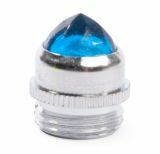 As a light source can be used miniature glim lamps, neon lamps or LED diodes. Indicator lamps with LED diodes have a very long lifespan and very low energy consumption, making them comfortable and cheap solutions. Vikiwat Ltd. offers a wade range of panel mount indicating lamps 12V, 24V and 220V with different housings and mounting ways in stock. Welcome in our online shop and get the best price!